Scandinavia has repeatedly been called the best place to live, to be a woman, or to be old, as well as the happiest place on earth. Michael Booth, travel writer and journalist, wanted to find out why: What is it about these countries that is so spectacular, and are these surveys and polls accurate? What makes these countries and their people tick? Booth explores Denmark, Iceland, Norway, Finland, and Sweden on a cultural and anthropological tour. Along the way he speaks with various officials, scholars, local friends, and strangers and collects their thoughts on everything from alcohol consumption to taxes. Clever with his questions and astute with his own often witty observations, Booth is an anthropological Bill Bryson. Each country is explored for its individuality and sameness. Sweden is often listed as the best place to live if you’re a woman because of (among other things) its free daycare. In fact, 82% of toddlers are in Swedish daycare, the highest ratio in the world, but there is social pressure to use the daycare and return to work immediately. Not using this childcare golden opportunity makes a woman an outsider and an anti-feminist in the perspective of Swedes, and there is social shunning, according to Booth, but he doesn’t share with readers exactly how a person is shunned—are they no longer invited places, called names, find their houses egged? While Swedes view positively the encouragement of independence, even from family, Booth asks how this affects children and family, and notes this encouraged solitude leads to cultural isolation for the country as well. Plus, though independence is encouraged and supported up through elder care, Booth points out that this really results in a dependence on the state instead of on family. In Denmark, Booth’s country of residence, he examines hygge or coziness that paints an ideal picture of social gatherings and long, sometimes drunken, evenings in Denmark. As part of hygge, friends of various socioeconomic statuses get together to eat, drink, and sing songs. These cozy gatherings seem like the social balm to the American or British workaholism and technological isolation, but attending social gatherings is expected. Danes are supposed to be joiners, and to not join in suggests you are different or separate, and that’s not good. Beneath the veneer of hygge is the unwritten social rules of Jante Law. One such “law” is the pressure to recognize and remember you are not better than anyone else. Jante Law seems like a great equalizer and humbler, especially in moments of hygge, but this squashes individuality, innovation, and ambition, and the country in turn suffers for this economically and culturally. Readers are given a glimpse into the various tensions and downfalls, successes and ideals of the five countries that often make up Scandinavia politically and geographically. 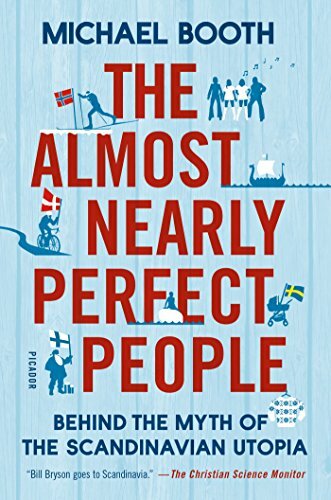 Fans of Bill Bryson’s work and folks interested in Scandinavia will love The Almost Nearly Perfect People.